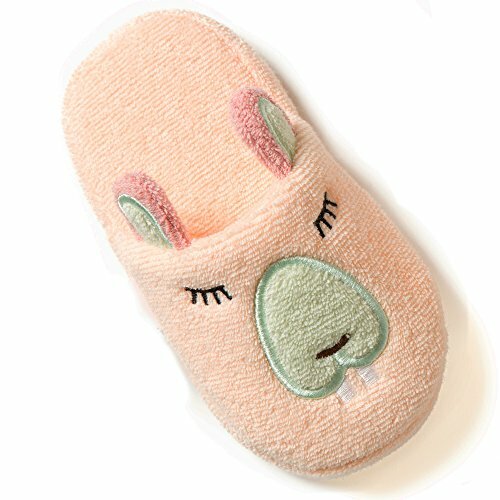 Breganwood Organics Kids' Animal Slippers keep little feet warm and comfortable! Your little ones will love these slippers, and best of all they coordinate with our Rainforest & Woodland Collections of hooded towels and bath mitts. Easy to slip on, your little will be proud that they can put them on all by themselves! You know kids often like to go barefoot, but with these adorable slippers, they will be happy to wear them - all the time. And with non-slip soles you don't have to worry. The vamp and foot bed of the slipper is made with organically grown cotton terry. The sole has just enough foam to provide cushioned comfort. Warm, cozy & cute these toddler slippers are sure to be a favorite! Order now, Breganwood Organics Kids Slippers! The model in the photo is a Size 9 Toddler per the Amazon Kids'Shoe Fit Guide. SIZE: Slippers are 6 1/4'' long and 3'' wide at the widest part. They are designed to fit kids between 2 and 4 years old. But as you know, children grow at different rates so please measure your child's feet before ordering. If you have any questions about this product by Breganwood Organics, contact us by completing and submitting the form below. If you are looking for a specif part number, please include it with your message.